Scale model photo by Andrew Daddio. It was standing-room only at the Colgate Inn on Thursday evening, June 27, when architect David Adjaye revealed to the Hamilton community his firm’s design for the university’s proposed Center for Art and Culture (CAC). Adding a civic/cultural/educational institution to a commercial area, Adjaye said, “gives us the opportunity to have a new way of understanding the nature of that area.” Planned for the site formerly occupied by Parry’s hardware store between Utica St. and Madison St., the center would replace that building in the heart of the village. The design employs a three-sectioned structure, rising from Utica Street to Madison Street, whose placement and off-kilter junctions, Adjaye noted, “playfully acknowledge” the geometry of existing buildings and asymmetry of the downtown’s roads. “We wanted to follow the scale of the buildings that exist, and the memory of the building that it will replace,” he said. Each section is assigned a specific function, and yet the design allows for fluidity both between and within them. Facing Utica Street, the community space would be approximately 15 feet tall and would include a flexible room for public functions, as well as offices, a reception area, and amenities. The Longyear Museum of Anthropology would occupy the slightly taller center section. On the Madison Street side, the Picker Art Gallery would be about 30 feet tall. Both collection sections would include exhibition space, seminar rooms, project space, and archive space. The structure will take up approximately one-half of the lot, said Adjaye, with parking to the north. On the south side, a lane from Utica Street will open up to a sculpture court and more open space as one approaches Madison Street. The façade will feature vertical blades, or fins, of pre-cast aggregate stone panels reflecting the color of the adjacent brick buildings. One side would be transparent so that passersby can glimpse the activities and artwork within. 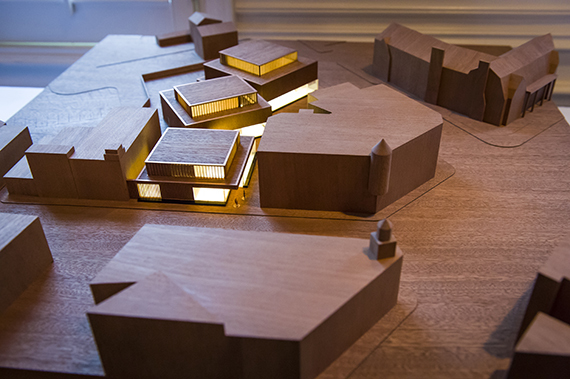 The building would work as a lightbox, Adjaye said, with clerestory windows and uplighting rather than floodlighting. Adjaye addressed a range of questions from the audience, including the process from here. The design has been endorsed by Colgate’s Board of Trustees, pending fundraising to finance the project. Next, Colgate will submit the plans and a State Environmental Quality Review environmental assessment form, including parking and visual impact studies, to the Village of Hamilton’s Board of Trustees, who will consider whether to redefine its B-1 business zoning, which currently does not permit museums or art centers. Once all approvals and funding are in place, Adjaye estimated that construction would take about a year to complete.